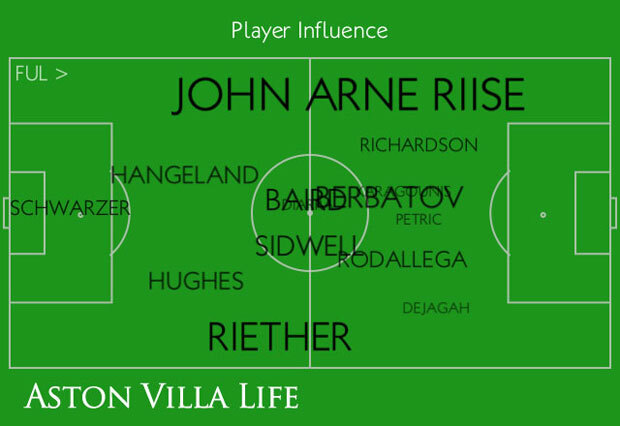 Talk Tactics – Is Staying Narrow Aston Villa’s Main Flaw? 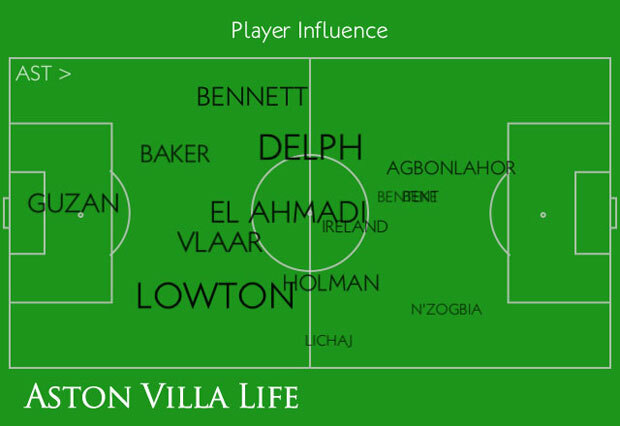 AVFC | Aston Villa Life - An Aston Villa Blog and Mobile Site for iOS and Android > Aston Villa Blog > Columns > Talk Tactics > Talk Tactics – Is Staying Narrow Aston Villa’s Main Flaw? I wanted to start my piece this week with the first verse of one of my favourite poems – “If” by Rudyard Kipling. In the current circumstances, I am sure one can see just how applicable it is, describing as it does the words of how a leader must lead. Which is fundamentally something we have lacked over the past two years. Even now, the confidence of the team is shaky, something that exhibits itself with regularity as heads go down after goals, or one player or another fails to work hard enough – the solution isn’t an easy fix. Here we can see quite clearly that there are a swathe of red arrows going from Villa’s goalkeeper to the wide left position, presumably to take the advantage of Gabriel Agbonlahor’s pace as a weapon, or Darren Bent’s ability to poach. However, the fact remains that many of those passes did not complete – a full 73.3% of them did not. 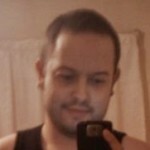 So why bother with long balls? As mentioned above, the pace of Agbonlahor is one of the weapons along with Bent’s poaching that Villa has to use but, with that in mind, their abilities aren’t being used if the pass isn’t completing. Looking at the bigger picture statistics, that of possession and territory, it was clear that the game wasn’t lost by Villa being totally dominated on their side, much as a 1-0 scoreline often illustrates. So what now? Therein lies the million dollar question as panic rapidly enters the psyche of the average Villa fan. If the club are losing, what do we do to get things going? Do we change the players? Do we keep them the same and hope for the best? Interestingly, three of the best passers on the pitch for the game were playing for Villa. Perhaps unsurprisingly, the top three Villa players were Fabian Delph, Karim El-Ahmadi, and Ron Vlaar – two of which being Paul Lambert purchases, and the other a player he has restored to the team. The other two players in the top five passers were Chris Baird and Sascha Riether. Perhaps surprisingly, one of the worst passers for Villa was Brad Guzan who only completed 13 of 35 passes attempted giving a lowly 37% completion rate. Other players completed less passes than Guzan, though they also attempted less thus having far better completion percentages. We all know that Lambert’s passing philosophy relies on a tight, short passing game. With the majority of Guzan’s passes not completing, and all but a small amount of those passes being short, he may well pay a price for sloppy distribution as I imagine Shay Given will be pushing hard for a place. One of the other players who had a poor completion rate was Eric Lichaj who completed 5 of 11 passes attempted (45.6%), perhaps illustrating that he isn’t a solution on the sides of defence in Joe Bennett (33/37 – 89.2% completion) or Matthew Lowton (38/45 – 84.4%). However, fans don’t just look at passes and Christian Benteke was seen to get some stick from fans after missing what was deemed an “easy” chance, or one that some had suggested Bent would have scored had he still been on the pitch. Again, this is subjective, and with Benteke a mere six-or-so weeks into his career at Villa Park, it is far too early to be suggesting the Belgian striker is “rubbish”. After all, with two goals during the international break, Benteke clearly knows how to score, leaving reality to suggest that Villa’s problems lie in creation. A lot of Villa’s problems are currently residing between a combination of two key statistics – the chances that Villa create, and their ability to finish those chances off. With Villa having the second lowest conversion rate for chances of all Premier League teams before the Fulham game, it is those kinds of statistics that prompt concern amongst fans. How Villa deal with it comes from a bit of an either/or option in playing wide or narrow, yet both have their problems as I’ll come to shortly. 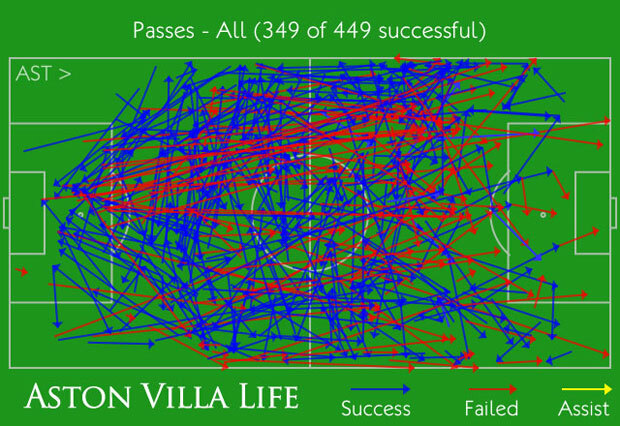 The final problem for Villa against Fulham was the inability to handle pressing football. Like any team hoping to play well, Fulham pushed forwards using the wide areas as the battlegrounds with which to either play two vs. one, or to otherwise pull apart a midfield that has to move or cede the wide areas. In short, these graphics, along with past evidence suggests it is quickly becoming the way to beat Villa by simply playing 4-4-2 or, at the very least, by using skilful wide players to exploit the flanks. Fulham played 4-4-2 and won. Southampton did the same. Tottenham didn’t play the formation, but used wide players to great effect. Everton played 4-4-1-1 and won. This isn’t to suggest that 4-4-2 is the answer for Villa, but rather to realise that a lack of width is a real killer for the team. Sadly, it isn’t as easier as just saying “play wider” as the only way Villa are currently stopping the central midfield of other teams is by packing their own central midfield. If they change that around, they will instead end up with the same issues, just in different areas – frustrating to say the least. The solution? It’s far from an easy one. If it was, I’d be the first person to be telling the club as we all want to see us win games. Some of the flak seems to fall on Lambert’s purchases, though statistics seem to back up the fact that it is Lambert’s purchases that are statistically the best players on the pitch. The solution is invariably working hard, picking players who are willing to follow orders, and doing the best to get rid of players/get new players in January. However, it isn’t January yet, so Lambert will have to do as best as he can with what he’s got. Sadly for the club, the ingredients Lambert has from the group of players he hasn’t signed aren’t of the best quality. Fingers crossed that will be enough to win the next game, one that may turn into a grudge match between ourselves and Lambert’s former employers. This entry was published on October 22, 2012 / Matt Turvey. 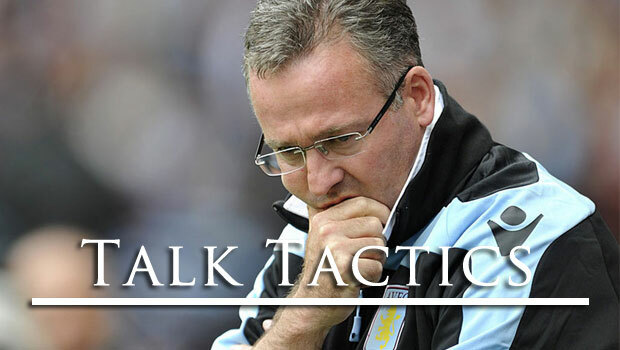 Posted in Aston Villa Blog, Columns, Talk Tactics, Turvey's Thoughts and tagged talk tactics. Bookmark the permalink. So Fulham won against Aston Villa. Matt Turvey works out what went wrong. With Aston Villa suffering another loss, Matt Turvey tries to find the root cause of the club's issues.